Phuket is the largest island in Southern Thailand and is one of Asia’s most popular beach destinations on trips to Thailand. Surrounded by the Andaman Sea to its west and various bays to its east, Phuket features powdery white beaches, magnificent coves, lush mountains, and hospitable people. Located approximately 536 miles (863 km) south of Bangkok, Phuket is approximately the size of Singapore, and the province’s borders include other smaller, nearby islands. Previously named Thalang, Phuket is located on one of the major trading routes between China and India, attracting the competing Dutch, English and French for its tin and rubber resources. 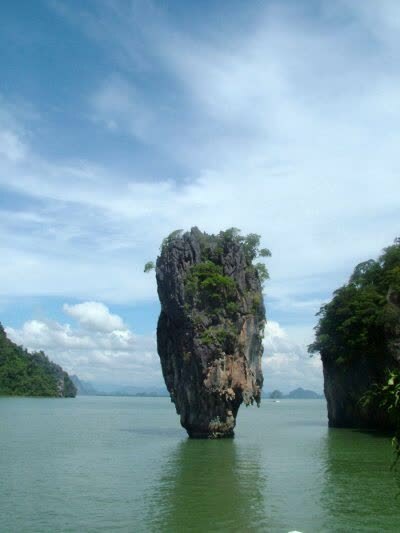 More recently, tourism has prevailed, making Phuket the wealthiest province in Thailand. Even after the Boxing Day Tsunami of 2004, Phuket soon rebuilt, leaving no traces of any damage, and continues to further expand its urbanization by developing more hotels, apartments and houses, attracting both tourists and retirees on Thailand tours. While Phuket’s west coast features the most popular beach resorts, including Kata, Karon, and Patong (known for its nightlife), its east coast is gateway to various islands. Visitors on Phuket tours can enjoy a cruise through Phang Nga Bay and observe the many limestone karsts and maybe enjoy a seafood lunch. The capital town of Phuket, located southeast on the island, has the highest population in the province and is its economic hub. A great place for Thai shopping, Phuket Town features an architectural blend of Chinese, Thai, and Portuguese buildings and shops. Offering plenty of water sports, golfing, world class resorts, mountainous beauty, and tropical climates on a Thailand vacation, it is easy to see why Phuket is known as the ‘Pearl of the Andaman’.